« The Next PSA Leader Could Be You! 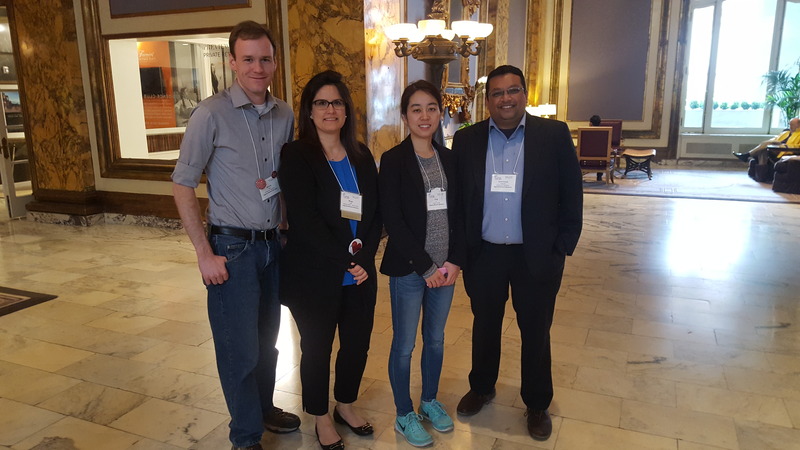 Four Argonne Postdoctoral Researchers and Fellows attended the 2017 NPA Annual Conference, held in San Francisco, March 17-19. The NPA Annual Conference is the largest national conference and networking event dedicated to the postdoctoral community. Conference attendees – postdoctoral scholars, administrators, faculty, and representatives from disciplinary societies, industry, and corporations – are provided with the opportunity to gather and enhance their professional development and leadership skills. Postdocs and Fellows interested in attending the 2018 NPA Annual Conference need to complete the Interest Survey by January 10th. Questions should be addressed to khenne@anl.gov. What benefit do postdocs gain from attending the Annual Meeting? Read on! Attendees were asked why they wanted to attend the conference, what they gained from attending and what was their favorite part. (Some content edited for clarity and length). Aaron Oaks (NE), Muge Acik (NST), Ying Li (LCF) and CK Kaligotla (GSS) at the 2017 NPA Annual Conference. “The main reason for me of wanting to go to the NPA meeting is to get more connection with the postdoctoral society outside of Argonne. I have been at UCLA for three months as a postdoctoral researcher in the year of 2016, where the postdoctoral community is a bit of different from a national lab setting. For example, as in a university, there might be activities/mixture with graduate students more than in a lab. For me, I feel it is important to acquire that information to help better navigate the research and life for postdocs from a higher perspective. I got to know Muge, Aaron, and CK from Argonne. I am happy to know them better, because we are often caught up with our busy life as a postdoctoral researcher. It is a good chance to have known colleges outside our division who does entirely irrelevant research of our own. “The major takeaways vary for different postdocs. As a female and foreign named postdoc from Argonne, I have many viewpoints from which to reflect on the NPA. I learned that Argonne postdocs have more benefits, including health insurance, sick leave, holiday breaks, etc. compared to other places, which makes me appreciate the experience as a postdoc here more. As a postdoctoral researcher in a National Lab, we are often surrounded by intelligent people similar to us. However, this does not reflect overall society. We have to be mindful of differences in experience when communicating with family members, neighbors, or to any people encountered in daily life. Postdocs are transitioning from a student to an independent researcher. The postdoc period can be very good, as you are funded to do what you are good at and not worrying about funding, resources. However, we need to let ourselves learn from mistakes and be proud of our accomplishments, regardless of our future career decisions. What were your reasons for wanting to go to the NPA conference? “To meet with postdoc association officers from other labs and universities, learn about their activities and experiences. What were the major take-aways that other postdocs should know about? Most Postdocs share the same fears , challenges and also deal with it in very similar ways. Postdocs need to network, a lot, to figure out available options and opportunities, especially outside of academia. Avoid being shut into you bubble.Learn to communicate your research and your skills effectively to a very general audience. This entry was posted in Announcements, Distinguished Fellowships and Divisional Postdoctoral Appointments, Events and tagged networking, NPA, opportunity, Professional Developoment. Bookmark the permalink.